First, I thank Roy for sending me his book, Everville : The First Pillar. We also would like to wish him good luck with his book series. Before I start off, we ( Me & My good friend - Fire Drake a.k.a Dhivya who co-writes the blog with me) would like to congratulate you on the success of your book! Way to go! Q1. Owen sage and the battle with Them! What/Who is your inspiration for this book? The book started out as descriptive paper for an English class. I received a lot of interest in turning the story into a book. Once I decided to write the book, the meat of the story came from various influenced as well as some ideas I had on my own about constructing a conflict between good and evil. Q2. In the story, it is not explained why Owen in particular got pulled into Everville and why he is particularly entrusted with the task of fighting the evil Them. Do we get to know that in the future books? Yes. This will be explained further, and it also has a lot to do with the plot in upcoming books. Q3. The Naming of your characters is quite unconventional! "Dante" as we all know was an Italian poet and is not a really common name. And the place “The other In Between " is virtually a common English phrase and also the evil is called "Them" again a common English word. Any particular reason for such names? Again, the names have meanings that are associated with the characters. I don’t want to give too much away about the future books, but if readers pay attention to names, they can get clues about the story and character’s roles in forthcoming the plot. Q4. Now getting to something about you. 5 degrees in liberal arts, history, secondary science education, and Geo science! That's a whole lot of varied interests! How did you manage that!?! It was a lot of hard work! A couple of the degrees I worked on concurrently, and I had to do it while working full time. Lots of coffee helped! Q5. Apart from writing, what are your interests? I have so many interests. I love movies, hiking, eating out, travelling, karaoke, chess, good conversation, education, science, philosophy, art, and so much more. Q6. What kind of books do you read? Who is your Literary Inspiration? I’m a classic scifi fantasy kind of person, so all the greats Tolkien, Rowling, C.S. Lewis, as well as classics like Shakespeare, Poe, Longfellow, and others. Q7. Tell us something about the city you live in - Hawaii. I heard it’s a great place! I live in Honolulu, a city of about one million if you include greater Honolulu. The island is very diverse, from a densely population region that resembles Tokyo, to majestic scenic views just a few short miles away. There is great food, views, hiking, swimming, water sports, aviation, as well as the most culturally diverse state in the entire country. There is just about everything for everyone. Q8. Have you heard of India? We are from India, A country of huge diversity and many book lovers. Any plans of visiting India?! I have heard of India, studied India culture, and eaten a lot of Indian food. I love the curry! I hope to visit and would also love to visit regions in Northern India and the surrounding region. One of my dreams is to climb Mt. Everest. I would like to visit all the major peaks in the Himalayas, travel to Nepal, Tibet, and the surrounding areas. Q9. What can we expect from the rest of the books in the series?! I’m hoping to add more character development and descriptions, more world creation, more races and creatures, and so much more! I envision a film series of 7 or 8. I am writing the story with this in mind. I am hoping to add to the already great epic stories such as LOTR, Narnia, and Harry Potter and have the Everville series stand on its own as that kind epic series. I don’t know if I will achieve this, but that is my goal. To know more about the book or to get in touch with the writer hit the links below. HOW I GOT THIS BOOK: A net-galley request to read resulted in this most intriguing book. But Trouble Brewing pleasantly surprised me. Yes, it was a romance novel, and yes, there are more instances of intimacy, but the novel managed to pack in a few punching twists and turns. It also has a few ‘other worldly’ moments, entrances into faerie worlds, fables and prophecies, fauns and other mythical creatures in abundance. 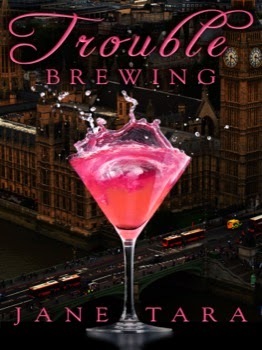 The London based clan of redheads are more exotic and Calypso, the lead protagonist, rues the loss of her One True Love, his unexpected change of mind and the turn of events that led her to her current state. An expert traveller and potion maker, Calypso helps everyone else’s love, all the while mourning her loss. She lives with her mother Batty, father Alf and sister Nell, in their famous pub. Calypso tries to drown her depression by a series of relationships that she always find lacking compared to her One True Love, Scott, Who was, according to tradition, an unreadable enigma to her otherwise flawless psychic abilities. Soon after Scott’s sudden departure, enters Taran, another man that she could not read. Calypso meets him by chance in her cousin’s shop and involves herself for a one night stand and gives him the slip. He follows her across the globe, unable to face rejection by any woman. Soon she finds herself unable to refuse the fact that she has found another man who she could not read. Another man, who might be her true love, has arrived out of tradition. Calypso feels that by loving again she will betray the memories of her past love. Taran imposes himself on her relentlessly, until Calypso decides to distance herself from him citing her father’s illness. The fear of loss of loved ones is portrayed well as the emotional moments tug at the simple readers heartstrings (well, at least, that was how it was meant to be for the fans of this genre). Taran follows Calypso who likes him but still distances herself for the fear of being too involved. Just when she decides he is the one, another loss threatens to present itself. And she distances herself from committing with Taran. But with the support of family and friends, Calypso decides to give another chance to love in her life. And, *spoiler alert*, Taran decides to move on with a past girl friend who had approached him, just when Calypso swallows her ego to reach out to him. In a reeling moment of shock, she closes up her shell, and Taran follows her to win her back, shortly after which another shocking revelation makes Calypso decide to lose her life. How she comes back to living a life and how she realises that not all Shakespeare women have only one true love forms the plot of the story. WHAT I LIKED: A myth-magic story line and a perfect rain read for Romance fans. Of course, there is the thoroughly unexpected set of twists in the plot. A special mention to the author for choosing her book covers fittingly. WHAT COULD HAVE BEEN BETTER: Loose editing, and again a lesser usage of a rare psychic ability. VERDICT: A rainy read and feel good book. 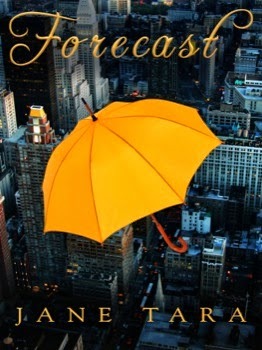 The need for a slight read and a promising review drew me towards Forecast. The novel began with the intriguing character of Rowena Shakespeare, nearing thirty years of age, and still waiting for the One True Love of her life. Born into a family of psychics and with special abilities to predict the day’s weather (perfectly, accurately, every single day, okay, that’s impressive) and to see not only the past, present but also the future of any man she kissed, (which she considers a curse). Living with her mother and grandmother and minding a shop of curios, Rowena finds her life boring. While waiting for the perfect man, she gets a job at a famous news channel, as a temporary replacement for a famous weatherman rendered immobile due to an accident. While meeting her predecessor for an approval, the girl finds herself strangely attracted. In spite of his reputation of being a ‘ladies man’, the fabled womanizer also has a heart breaking past to justify his actions. Events move quickly (to be expected in a romance novel) and Rowena finds herself more than involved with the handsome Henderson in a quaint romantic setting. But back home, the popular soaring rating of the psychic weather lady who replaced him evokes familiar qualities of jealousy from the lead who is misled by manipulations from others. He ends up upsetting the lady and ruining her job. How he realises his folly and apologises to his love forms the rest of the story. We also find the family of the leading ladies finding solace, true lost love and many such heart warming moments. Simple concepts like coming to terms with one’s losses, finding one’s true love despite all odds and finding a match in all sorts of unexpected ways, dominate the book. Rare moments of agony and annoyance are soon rectified. With quirky characters like an ever annoying but well loved grandmother, and an eccentric and aloof mother with the agonised but good at heart leading lady, the novel lacks any innovation but is surely a good read in terms of its story line. WHAT COULD HAVE BEEN BETTER: A unique concept of a family of psychic women has been rather under-used. The book deals with a familiar concept of finding love and life, and imposes itself on readers as a ‘one time read’. VERDICT: Go for it on a lazy rainy afternoon (you can get the hint from the umbrella in the book cover, of course!) when you want to read a relaxing and intriguing book. Here is one of the Romance novels that both engrosses you and impresses you only in its first read. EDITIONS AVAILABLE: Kindle, Paperback, Mass Market Paperback. PRICE: Rs. 253 for kindle edition.